The Northern Busway was also celebrating – last year it turned 10 and it’s appropriate our anniversaries collide, as it was this project that brought MRCagney to New Zealand. As Auckland grows, it’s hard to imagine the city without the Northern Busway. It stands as an example of how we can get transport right. 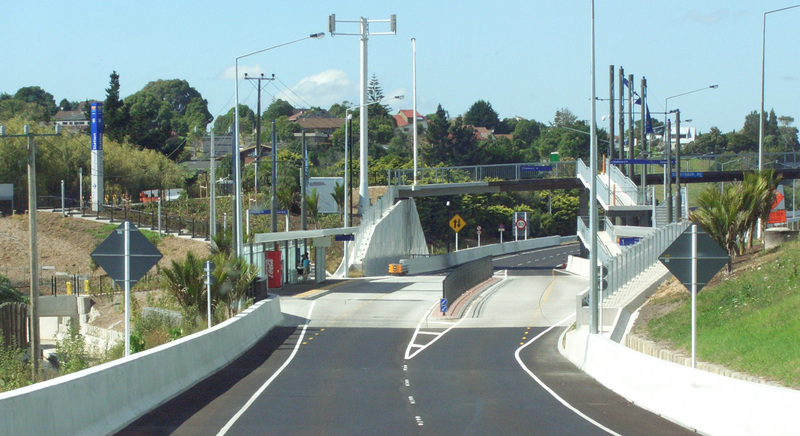 The busway connects Takapuna’s Akoranga Station (just north of the Harbour Bridge) to Constellation Station via a separated, dedicated busway running parallel to the motorway. But the services using the bus stretch far further, running from the centre of town as far north as Silverdale, a good 30km north of the city. Our involvement stretches back as far as 1991. In those days, the company was based in Canada, and called McCormick Rankin, but provided services to Australia and New Zealand. That arrangement later became official through a subsidiary company: McCormick Rankin Cagney. John Bonsall, one of our engineers and planners working in Canada, offered advice about the busway, followed by several related assignments for what was then Transit New Zealand, Auckland Regional Council and North Shore City. In the early 2000s, he and fellow engineer Ken Gosselin developed the Auckland Busway Planning and Design Manual. They also provided expert testimonial in hearings relating to corridor and station planning and acquisition. At first, a single lane reversible busway was proposed, but John’s work proved a two-lane busway with stations could be built instead. Further hurdles to face included bias against public transport by roading consultants, and cost/benefit studies based on car use, not public transport. Those challenges continued as the project reached the public realm. 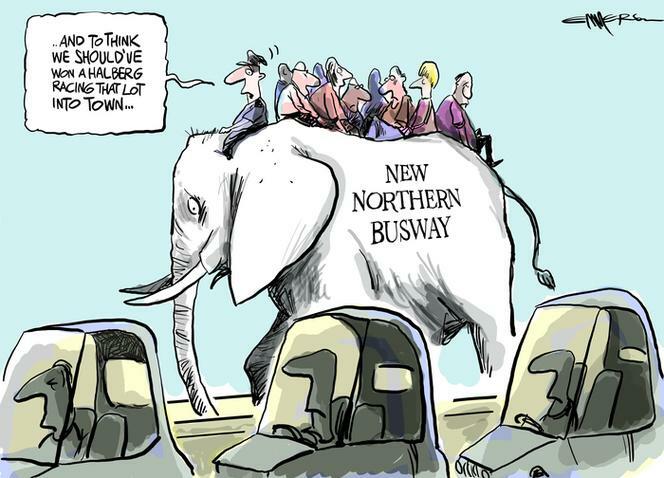 Public criticism of the project suggested the busway would never succeed, and some labelled it a “white elephant”. By definition, a white elephant is “a possession that is useless or troublesome, especially one that is expensive to maintain or difficult to dispose of” (Oxford English Dictionary). Some observers considered a busway outrageous, and the $300 million price tag too hefty. In fact, other options like carpooling lanes were considered so seriously that a visit to Constellation Station today will let you see a blocked off carpool lane entrance: part of the original design, just in case the busway failed. Ten years later, that entrance remains unused, while the busway teems with life. So, how do we measure the busway’s success? There’s the obvious – the passengers. 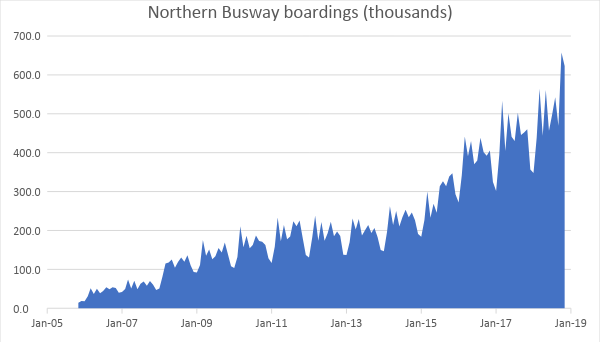 There are now approximately 30,000 passengers per day making use of the northern busway and bus users make up 40 per cent of people crossing the harbour bridge. That growth is equivalent to three new motorway lanes full of traffic. Northern Busway Boardings: The busway was first opened in 2008. Data from before this time is that of the Northern Express Service as it ran – in traffic with the cars. Auckland Transport started adding all bus services (not only the Northern Express) to the dataset in 2015. It’s also interesting to note the spike in November 2018 – the first month after the New Network reached the North Shore. The project has saved Auckland billions. Those billions would have been the cost of a new harbour crossing being built, out of necessity, well ahead of when it will now be needed. But wait, there’s more. The infrastructure itself points to the success of this piece of public transport planning, design and implementation. Since being built, the busway has been so successful there have been extensions to both the services using it and to the infrastructure itself. Northern Express buses have seen huge growth, quite literally. In 2013 they were upgraded to double deckers. The service has also been extended all the way to Silverdale, after originally only running as far as Albany. Perhaps the greatest mark of the success of the busway is that it has changed opinions. The Herald’s John Roughan was a vocal critic of the plan. “Nobody would put their own money on the prospect that commuters will leave their cars at home, or at suburban terminals for the day, in sufficient numbers to make it pay,” he wrote in 2007. This year, he all but admitted he had been proved wrong. The Northern Busway is the project which first brought MRCagney to Auckland. Its success is ours too. When we look back 10 or 15 years, it’s clear that what was once dubbed a “white elephant”, was in fact a golden goose for Auckland.